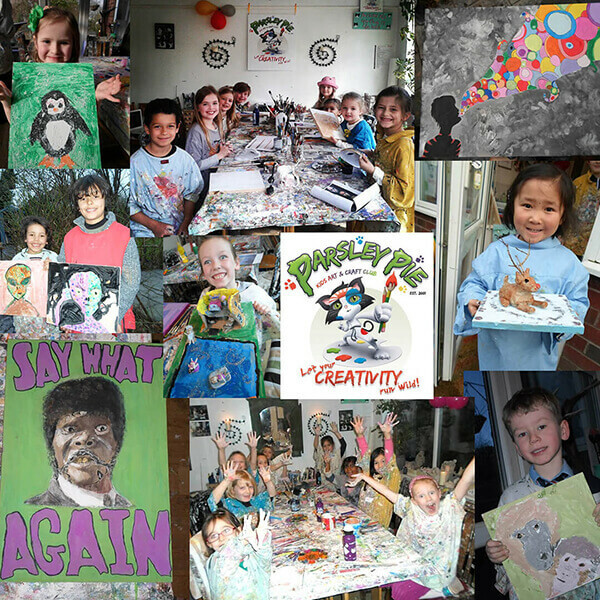 Founded in 2001 by professional artist & dancer Jenny Bent, Parsley Pie Art Clubs are unique art retreats for toddlers, teens & all kids in-between! We focus on creativity, laughter, learning & freedom of expression! Small relaxed groups were children have the time & space to be themselves, use their initiative, imaginations & explore, while help is always on hand! & YOUR HOME STAYS CLEAN! We welcome children of ALL abilities. They work at their own pace in their own way, no pressure, no right or wrong! We encourage positivity, uniqueness, individuality and ultimately happiness! We are a long established trustworthy business with an excellent reputation! We come highly recommended! 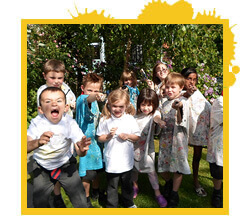 A huge range of activities, materials & projects to choose from! THEIR CREATIVITY CAN RUN WILD AND YOUR HOME STAYS CLEAN! My little girl just loves attending Parsley Pie, she has been attending since she was five years old and the creations she comes home with are just fantastic, each week there is something unique and lovely. Jenny is absolutely amazing and the whole concept of Parsley Pie is not like any other art and craft class I have seen, again, it is very unique. I cannot recommend Jenny and her fab, fab classes highly enough! Ellie & Harvey both adore The Parsley Pie Art Club and especially Jenny. The standard of art that they are producing week after week is amazing, whether it be a painting, sculpture or clay art it is worthy to be displayed in any gallery – all thanks to the inspiration, patience and guidance of Jenny. Sam has loved attending Parsley Pie and has created some amazing artwork and models which I would struggle to help him develop at home. It’s wonderful that they can work as individuals and have a choice of what they do each week. He thinks Jenny is really great. 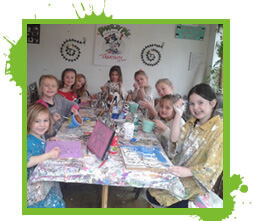 Lauren (aged 7 ) loves coming for her Saturday morning art class – your studio is her favourite place to go to and her art class her favourite time of the week. 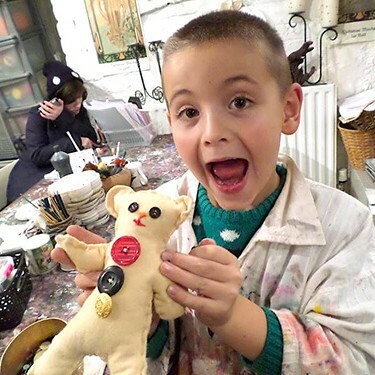 It is fantastic that the children have such a huge range of things to do at Parsley Pie, I have never found another children’s activity where there is so much choice in each session! Jenny is a highly skilled, very creative & very patient teacher! Harry (10) & Megan (8) love Parsley Pie art club! They have been coming for over 3 years mostly during the holidays as we live in Crewe. There isn’t any where else nearer to us that offers such an opportunity. Jenny is an inspiration & the choice of activities is fantastic! Jenny is brilliant with kids, she brings out the best in them! My 2 boys love coming to Parsley Pie in the school holidays, I only wish we lived a bit nearer as i know they would like to come every week! Jenny & the art club are a great mix of professionalism, creativity & caring. My daughter, Anna (seven very soon! ), flung her arms up in the air with joy when I told that a space had become available for her to go to Parsley Pie Art Club on a weekly basis. She then quickly added, “So, can I go today?” with a smile on her face. Jenny is a wonderful example of an individual giving something to the world rather than just taking! Lucy has been attending the Parsley Pie Art Club for six years and relishes her Saturday mornings with Jenny! Lucy has a true passion for art and Jenny has nurtured and encouraged her artistic development. Lucy’s only dream is to be an artist like Jenny – with Jenny’s help her dream may come true! Jenny Bent has given my sons the opportunity to experiment and develop their artistic side. She is patient, encouraging and brings out the best in them. Noah and Ben love going to her for a lesson and talk about it during the week before their next one. Thank you for giving them the opportunity to go somewhere where they feel ‘at home’ and really enjoy going to. Dearest Jenny, a dear friend of ours, Kate had been taking her daughter Tess to Parsley Pie daughter for a long time. On very special occasions, wonderful gifts would be given, that Tess had done with Jenny. After being thrilled by our unique gifts, I couldn’t wait for my little girl, Katy May, to join Tess on her fantastic journey of creativity. As soon as Katy May was old enough, age 5, off she went for her fab hour of fun. I can honestly say, Katy May has thoroughly enjoyed every single visit. She is now 6 and a half and has recently been joined by her little sister Gracie, Who has been chomping on the bit for what seems like an eternity to a 4 year old, to join her big sis and get in on the fun and the master piece production. My only concern is, we now have to find the money to buy our next door neighbours house, so we can knock through and create our very own gallery! Cloey (aged 5) enjoys coming to Parsley Pie Art because the club gives her a chance to use her imagination to create the things that she likes. 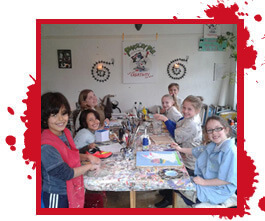 The club provides all the materials that are needed, and the teacher is very kind, patient and experienced. Cloey likes her teacher very much and she has made a lot of new friends in the club. Cloey enjoys the process of creating her works, and feels proud of herself when her works are finished. Classes are organised in small groups, every children are well care and supervised. I would highly recommend the club for any parents whose children are interested in drawing, painting, or making crafty stuff. I’m sure your child would have a great time there! My son has been going to Jenny’s brilliant classes for about 7 years! He just loves it! A place for him to relax and do his own thing, i hope Jenny is still going in another 15 years!! What a wonderful club you offer to children. 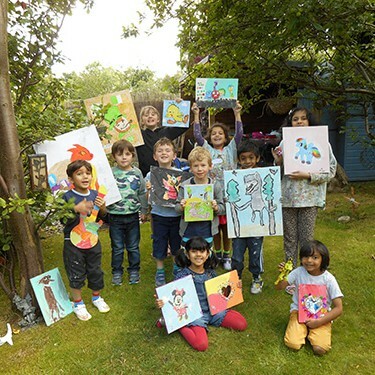 We love the way you give children the freedom to create their own picture, model, collage this develops their confidence and creativity and happiness. My daughter as you know has moderate learning disabilities and struggles with load noise and socialising which hinders her socially. What your club has given her is the ability to mix in small groups with many different children. She can be left with you and enjoys her hour creating laughing and having fun. You have opened a door for her which us often closed to more sensitive children. Thank you Jen amazing work you do its fun and rewarding. We also love your holiday workshop instead of being cooped up she’s getting colourful and creative. It’s epic, I love it. You can create anything you like! My children Michael and Gerard love Parsley Pie they love the freedom and fun of the art activities. They love the environment and Jenny.. They can’t wait to find more time to return for more sessions. Eloise loves Parsley Pie and has produced some gorgeous pieces. She looks forward to it every week.